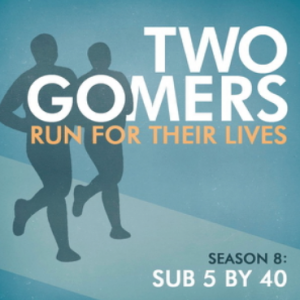 Both Gomers ran races last week, and they have a lot to say on the subject…and it probably won’t surprise you that Anthony started a full 5 minutes after everyone else did at his 5k, and that Steven is still aching from his trail race, an entire week later. Oh well, they are Gomers after all! THESE guys ran a Half-Marathon?! Also, discussions on the antics of Kanye and Kramer, another true Gomer confession, and the stiff competition the Gomers face on iTunes. Plus, the TV shows they’re most looking forward to this fall. You didn’t think they’d just talk about running on their running podcast, did you? You must be new. Monday Survey of the Week: We need help with our stretching routines. Actually, we don’t have stretching routines, and we’d like to. Should we stretch before or after the run? For how long? What are some stretches that have been helpful/harmful to you? We want to be limber and spry, you know. So help a Gomer out! Don’t stretch before you run. You don’t want to stretch cold muscles. Your best option is to do a 5-minute warm-up walk to get your muscles moving before running. Post run is the time you should stretch. If you are willing to take 15 minutes at the end of the run, check out the Nike+ Yoga for Runners on iTunes. It’s a good walkthrough of all the areas you need to hit. If you only have a few moments, just work through your body from head to toe. I found this video on YouTube, seems like a fairly decent routine. I read the article posted above; great info! I’ve been through lots of physical therapy, and I’ve always been told the same…stretch after, not before, for maximum long-term benefits. I would definitely like to see video of the two of you trying the Spider-Man stretches from the aforementioned article, though – talk about entertainment. 🙂 Thanks for the podcast; y’all are awesome, and keeping me going during long training runs! Same as everyone else – always stretch afterwards. There’s a great book called the runner’s yoga book by jean couch – lots of really great stretches with lots of ‘prep’ and entry level poses for those not yet flexible enough to get in to the full expression of the pose. It’s got a great 1980’s retro look as well. Dynamic over static stretching for sure! Also, something I just discovered – foam rolling after running and before stretching. This relatively inexpensive piece of foam has really helped me work out some super-tight muscles and contributed to my increase in flexibility. Seriously, I can’t tell you how much this has helped!